It’s hard to believe that it’s been only five days since we left Canada and we’ve already been through Washington and Oregon and are now deep into California. 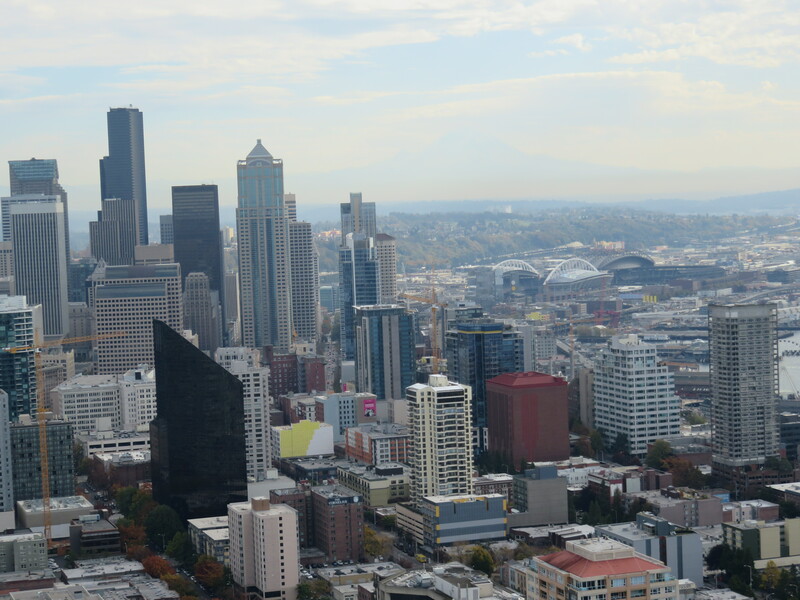 Our first stop was Seattle, Washington where we arrived at rush hour so spent some time crawling along Hwy. 5 before turning off in search of somewhere to park for the night. Jim wanted to stay in the downtown so we could tour on foot the next day. However, there was only one RV Park that we could find listed near downtown and we were told that it wasn’t really a “camping” type of park, but only for long term, i.e. minimum of 30 days. At 6:30, hungry and tired, we asked if we could park overnight in the gated Home Depot Store/Rental Centre. We could, but had to be out before things got busy in the morning. With no restaurants within sight, we ate my left over Quesadilla from lunch. Close by there was…you guessed it… a train track crossing, and a shipyard! Things got quieter after 11:00 pm, but at 5:00 am street cleaners were at work just outside our door. We were up and out of there by 6:30 in search of breakfast (we hadn’t yet restocked our cupboards and fridge since crossing the border), and a place to park for the day. After a couple of hours I suggested we drive further south to a KOA Campground that was close to public transit. We got settled in there just in time to catch the 10:15 bus that would take us to the rapid transit station. Well, it would have if we hadn’t missed the stop. We waited at the end of the line for another bus to take us back. 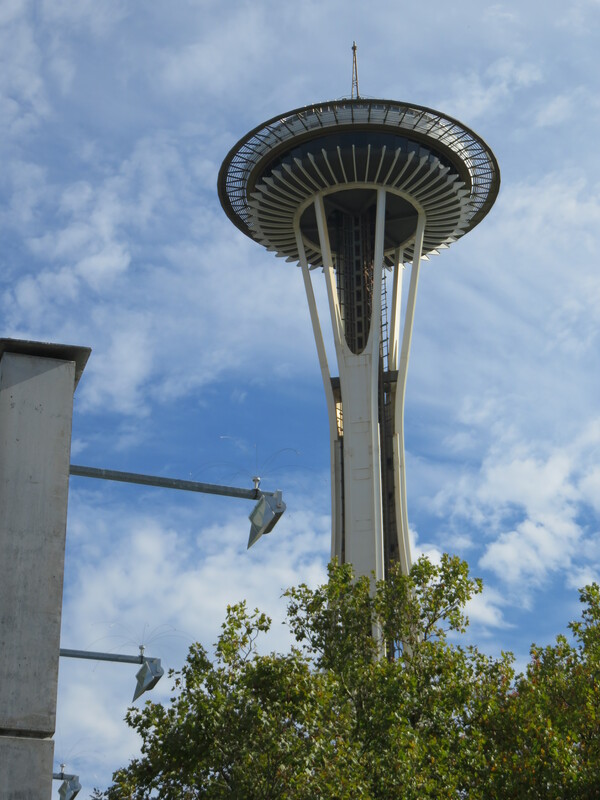 Finally, at noon we were sitting down to lunch in a cafeteria, and from there took the monorail to The Space Needle, a remnant the Seattle Worlds Fair, where our tour began. 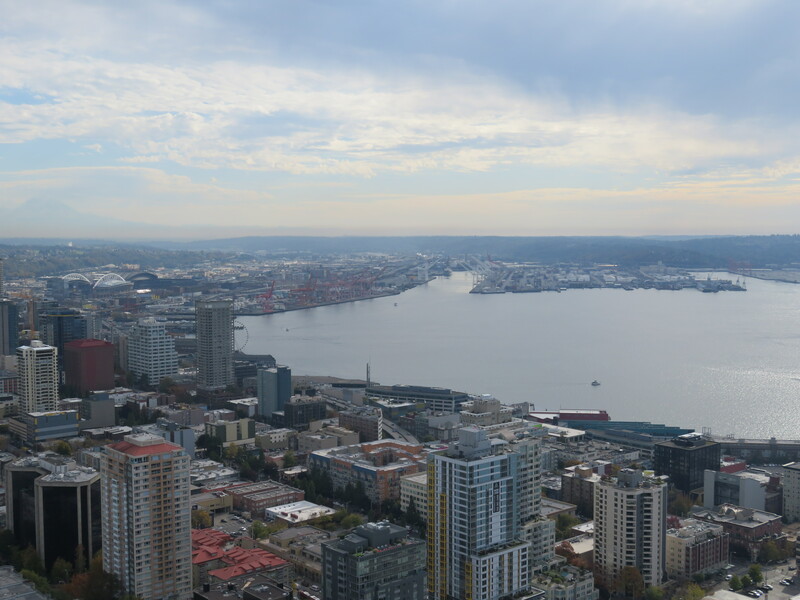 The view from the Needle was worth the hour wait. 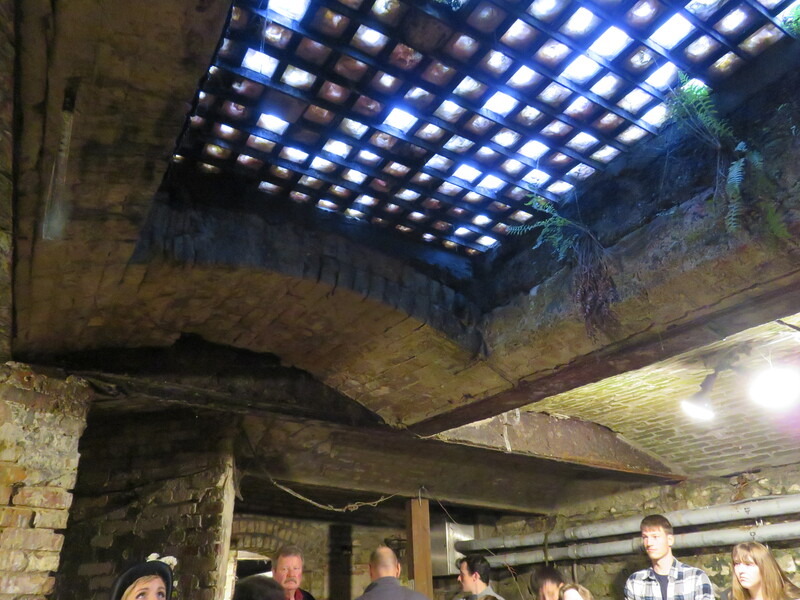 We caught the monorail back, and then the rapid transit to Pioneer Square, where we took the hour long tour of the Underground City. I found the history of the first city of Seattle interesting, but the actual remains not as impressive as I had expected. The tour guide was excellent though. 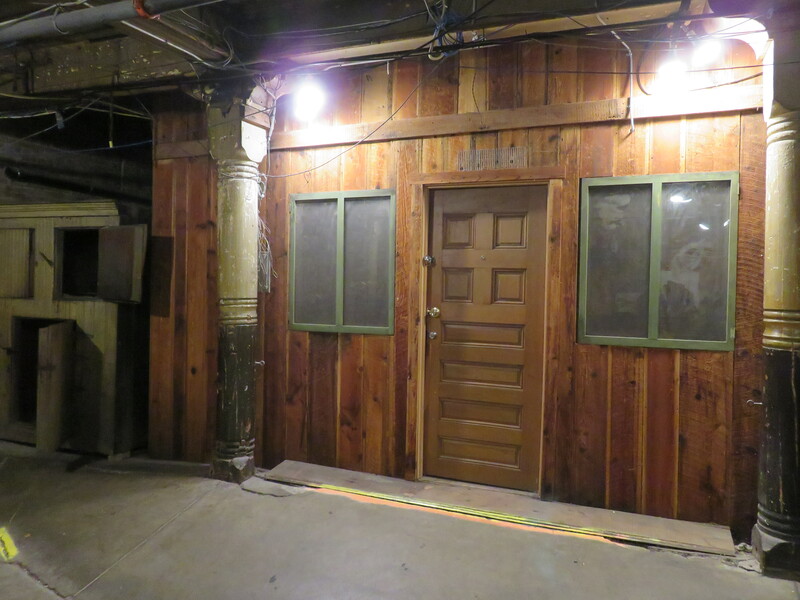 One store in the Underground City, perhaps updated? We’d planned to meet other Mesa friends, Nita and Fred, for dinner, but that didn’t work out for them in the end. After sandwiches at the nearby Subway, we boarded the train and bus back to the campsite. It was a wonderful day, but by the time we got back, at 7:15 pm it felt like midnight! I opened the fridge to get a drink of water and discovered that, from all the banging and bumping we’d done while crossing cobblestone intersections and jamming on brakes when it looked like someone was going to pull out in front of us that morning, a jar of Kalamati Olives had managed to flip completely upside down and all the juice had drained into the vegetable bins and the door shelves. Sigh. Not quite what I wanted to do that evening. The next morning we enjoyed a hot breakfast available at the campground, before we got on the road again. We drove through intermittent cloud and rain, but the temperatures started to rise. 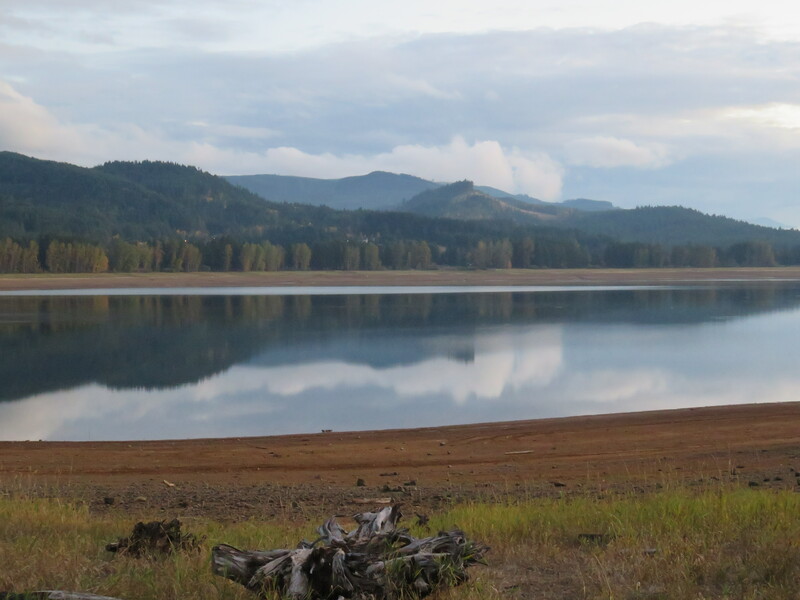 When we were ready to stop for the night, there seemed to be few campsites around, but I thought I’d found a good one on public land near the reservoir at Cottage Grove, Oregon It took a bit to find it, only to discover that it was closed for the season. I’d missed that little detail at the bottom of the description. However we found a day Park with a paved parking lot right next to the reservoir. We parked there for the night. Fortunately we had stopped at a grocery store to buy a few groceries so we had food for dinner and breakfast. 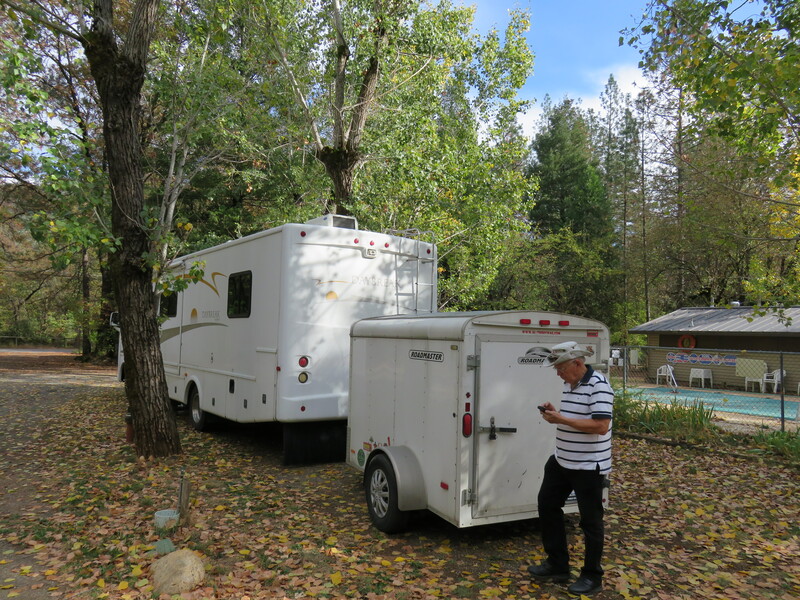 The next day, a visit to the Information Centre in California resulted in a decision to camp somewhere near the Shasta Caverns so we could do the 10:00 am tour the next day. 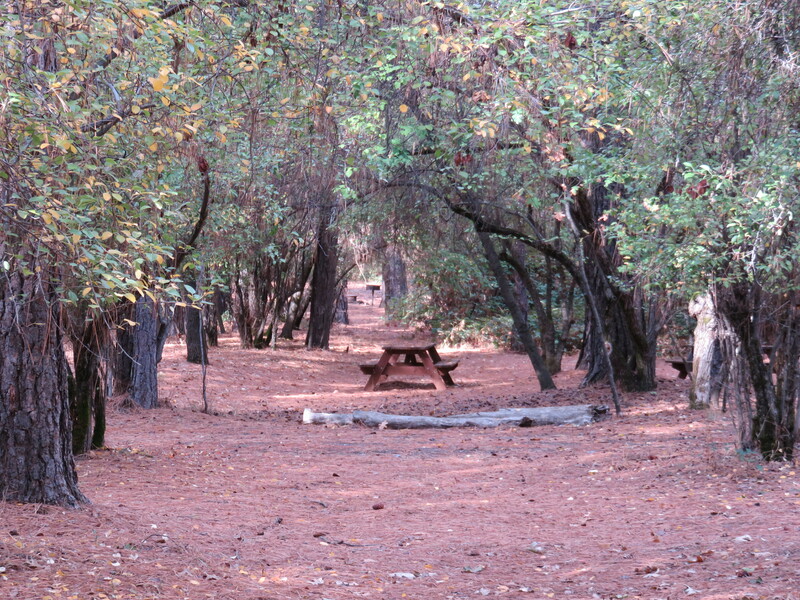 It was only 3:00 pm when we pulled into Shasta RV Resort and Campground, but it was nice to have a shorter day. 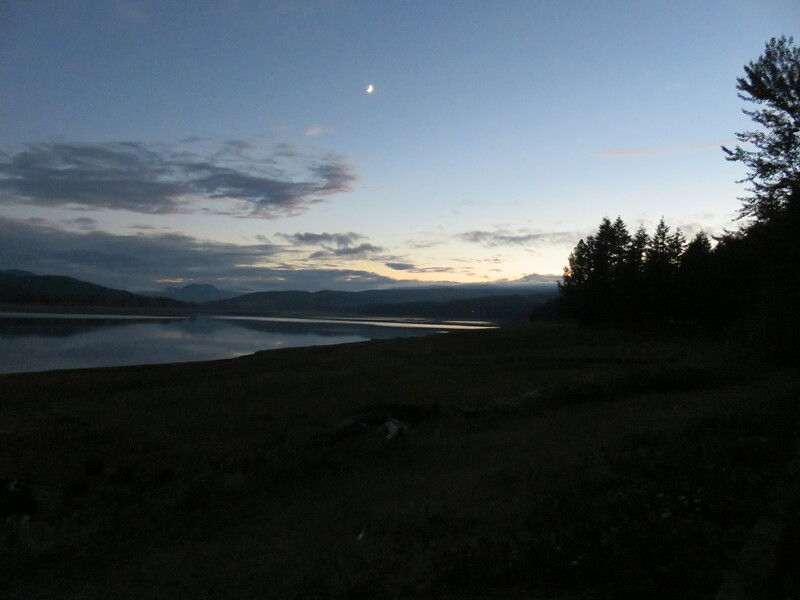 We enjoyed a walk through the forest and along the Shasta Reservoir while the sun was warm, and that evening we had great WiFi connections that enabled us to catch up on email, and I could add the pictures to my last blog post. If you want to see them, check it out. Today, we did the Shasta Cavern Tour. It was quite the adventure, one that I will share in detail in my next post. I will say that we enjoyed it, but we were reminded that we aren’t as fit as we should be. Tonight we’re at the Vineyard Campground, seventy miles away from San Francisco, where we will go tomorrow for a few days. 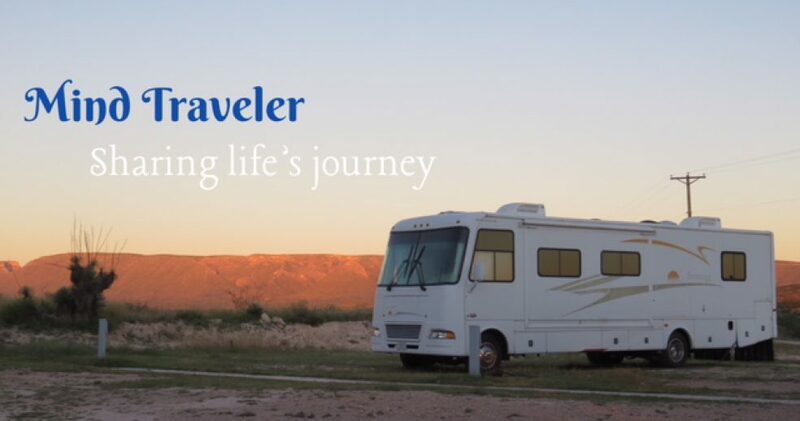 This entry was posted in Adventure, Motorhome travel, Photography, Travel and tagged adventure, Baby Boomers, California, Oregon, Photography, RV Travel, Washington. Bookmark the permalink. After all of your adventures, and misadventures, it’s nice that you caught a break from the State Trooper. You certainly are packing a lot into the time you have en route to Mesa. 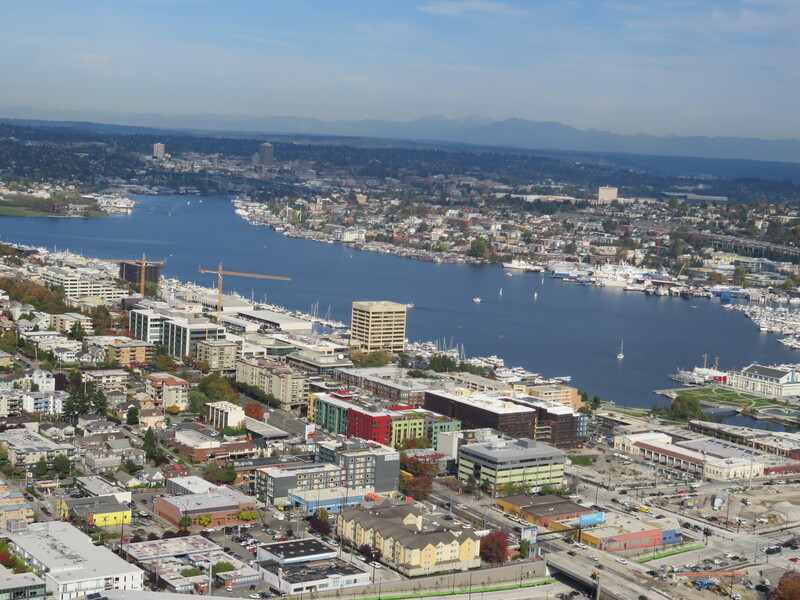 Your photos from the Space Needle are great. People were complaining about long lines at the voting places during the Advanced Polls. Yet they seem to forget that sometimes lining up brings a good reward. In this case–a new government. When we were looking at the Reservoir and deciding to camp in the parking lot, a State Trooper drove in and told us that we were not allowed to stay overnight. However, he said that he was off duty at 9 PM and no-one would be available to kick us out! It was a great camping spot.